At last, it arrived, the last training of this pre-season. The place this time in the circuit of Losail, just where in two weeks will begin the MotoGP World Championship. The pit-lane of the Sepang International Circuit end the first of three days of official test the MotoGP riders will complete from today and until next Monday. The day started quietly, with a Cal Crutchlow eager to start working on his Honda RC213V. The Briton was the first to go out on track within minutes of opening the pit-lane, although it was not until after 3:30 p.m. when the rest of the 22 riders who have been riding today in Qatar. The vast majority of participants in the test have chosen to close the door of their box after 20:00 in the afternoon when the humidity in the environment began to compromise the grip of Michelin tires under the lights of Losail. Finally, after six hours of testing, Maverick Viñales led this first day of official practice with a record of 1: 55.051, a time that the Yamaha rider established on his penultimate lap of the day, the number 48. Maverick has ridden relatively fast to be the first test day here at Losail, a circuit where it is always difficult to get good records on an opening day because of the dust and sand that is accumulated on the track. In fact, the Yamaha #12 has now fallen just one-tenth of Lorenzo’s fastest lap record in the race since 2016 (1’54.927). 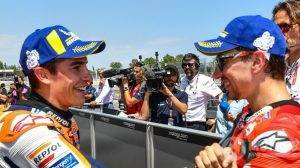 Good result also on this opening day for Alex Rins. The Suzuki, who already demonstrated his strength in the past test of Sepang with the best pace in the lap to return, finished today in the second position to only one-tenth of Viñales. 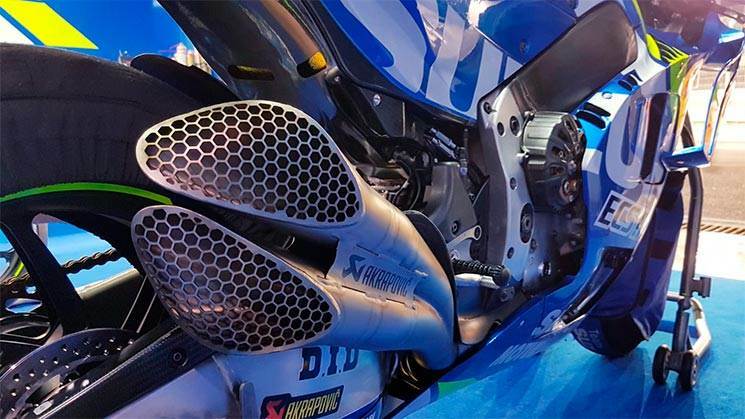 The Barcelonan has taken advantage of this first day of IRTA test to launch a spectacular double exhaust in his GSX-RR developed by Akrapovic during this last winter. Behind Rins we find the two Ducati factory riders, Andrea Dovizioso (3rd +0.499) and Danilo Petrucci (4th +0.543), focused today on working on the 2019 chassis of the Desmosedici. Valentino Rossi, meanwhile, finished more than half a second behind his teammate Viñales in fifth place, ahead of the day’s best private driver, Tito Rabat, who placed the Desmosedici GP18 in sixth position after completing 44 laps to the Qatari track , yielding a little more than six tenths of a point compared to Viñales. 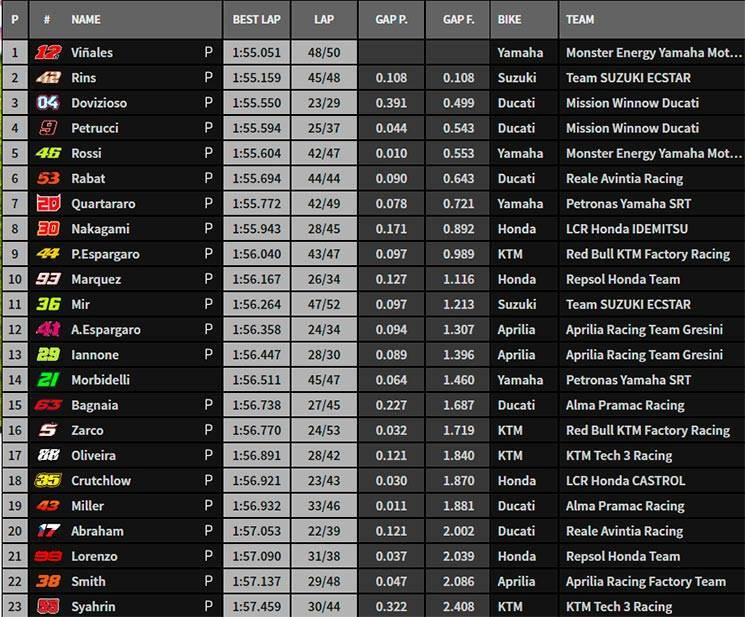 The top 10 of this first day was completed by Yamaha Petronas rookie Fabio Quartararo (7th +0.721), Takaaki Nakagami (8th +0.892 and best Honda of the day), Pol Espargaró (9th +0.989) and Marc Márquez (10th +1.116). The Spaniard has been the least active rider of the day with 34 laps, still conditioned by the pain that continues to drag on his left shoulder after the surgery he underwent in December. 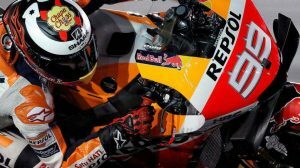 The five-time MotoGP champion has suffered a crash in the last Losail corner during the second test hour which, fortunately, has been unharmed. His teammate in the Repsol Honda, Jorge Lorenzo, closed the day in a discreet 21st position with 38 laps behind him, 2 seconds behind Viñales. The Spaniard is accusing his absence in the last test of Sepang and still suffers some pain in the left wrist that fractured in January while he was practicing dirt-track in Italy. 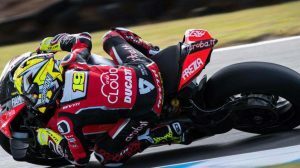 In addition to Marc Márquez, the two Aprilia official riders, Aleix Espargaró, and Andrea Iannone have also gone down in the same lap although in two separate incidents. Neither of them has suffered significant injuries and they have been able to return to the box to continue working. Tomorrow, Sunday, the action will return to Qatar.